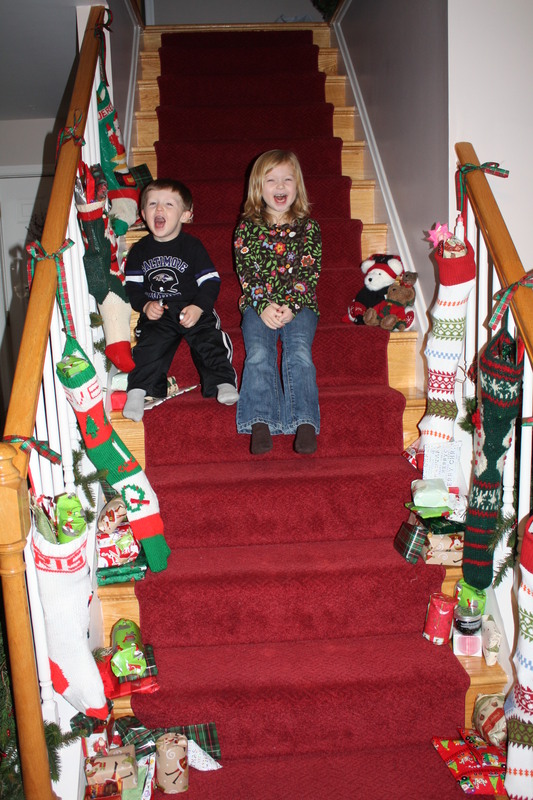 Christmas is just 2 days away, and I am honestly giddy with excitement. I look forward to this holiday all year. Between being able to spend time with my family, give gifts I have lovingly picked out and bake to my heart’s content, there is no reason for me not to love Christmas. Here are some of my favorite things that I’m looking forward to. 1. Baking cookies for Santa with the kids. 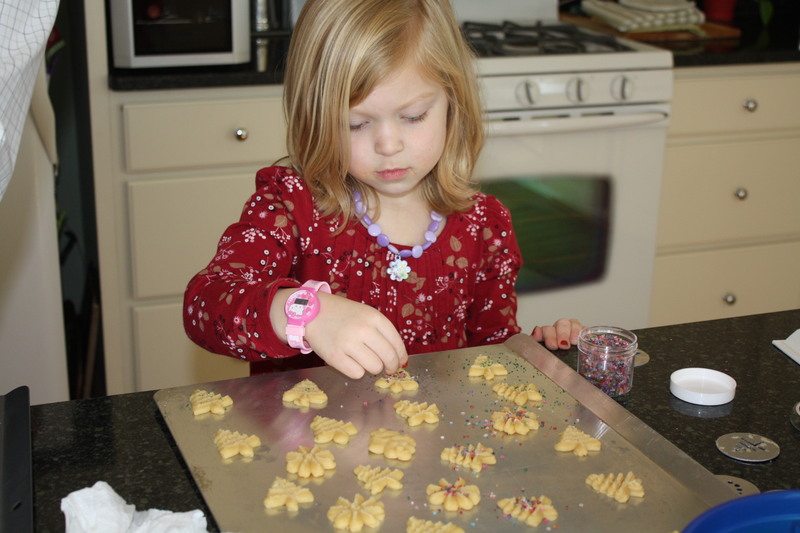 We usually do sugar cookies, but I might let the kids do most of the leg work with this easy recipe from Picky Palate. 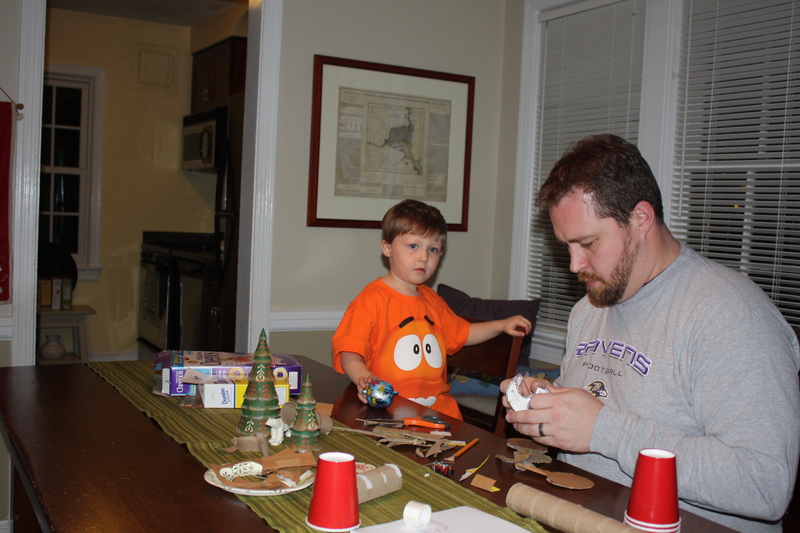 Mason helping with Spritz cookies last year. 2. 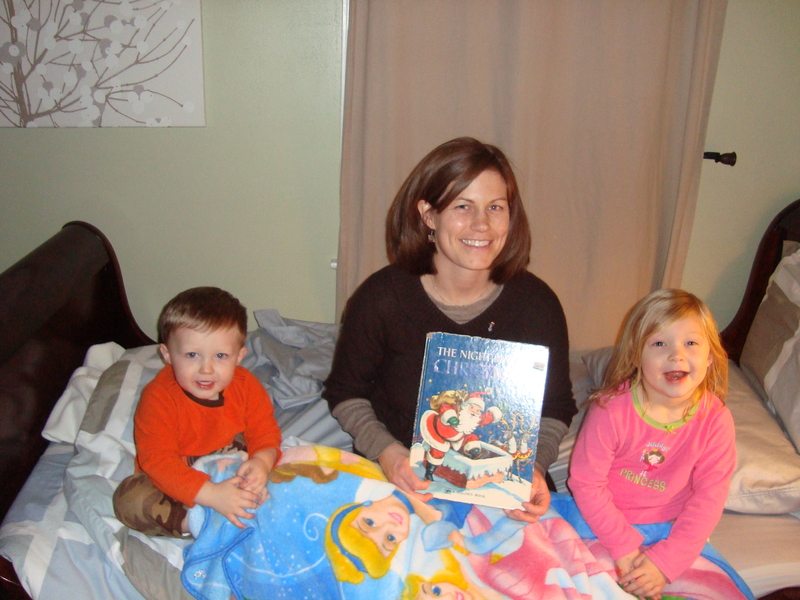 Reading The Night Before Christmas to Mason and Cooper from the very book my dad read from when I was little. 5. Stocking stuffers at my in-laws. It’s so over the top (and spilled out onto the stairs), and I love that every single gift is wrapped – no matter how mundane or extravagant. It’s a fun tradition! 6. Spending time with all the family. We get a full 24 hours + with my mom, sister, brother-in-law and nepher. That’s rare around the holidays so I can’t wait! And seeing Mason, Cooper and Hayes together is always a treat. I hear Hayes is kissing and hugging our Christmas card everyday, so I know he and Mason will have quite the reunion together. 7. The time between opening presents and eating dinner. We play with new toys, watch a movie and just relax. Oh! The joys of relaxing! 8. Time away from work. This year it is a huge blesing to have a break – I really need it! 10. The phone calls and texts with extended family and friends. I love spreading the love and joy! There is so much to look forward to. Sadly it is only a few days of celebration before life is expected to return to normal. But I won’t think about that now. I’ll enjoy the moment, the season, the love and the togetherness while I can. Merry Christmas to you and yours. May your hearts be filled this holiday season! 1. I am so glad we got the majority of our Christmas shopping done before this past weekend! We had to go to Michael’s for something, and it was mayhem in the shopping center. Sunday we got to the mall at 10am, and it was surprisingly empty. We were able to buy the last of our gifts (gift cards for all the teachers in my kids’ lives) and get out of there without any harm. When we were back near the mall 4 hours later, the parking lot was full! Thank goodness for Amazon and Etsy this year! 2. Did you know that bull-nose tile (the kind with the rounded edges that you install around the border of the shower) cost just as much as the amount needed for the entire shower surround? We learned that the hard way this weekend. Since gutting our bathroom 6 years ago and starting over, we’ve had to deal with a mystery leak. We’ve spent the last 2 years trying to figure out where the leak was coming from. And now the end result is that we have to tear out the entire shower area and install a new tub and new tile. I’m sure you can imagine how happy we are about this. And I’m sure you can imagine our surprise when the number we had in our head for buying tile came out twice as much thanks to all the bull-nose tile! BUT we’re very much looking forward to the new look in the bathroom that we chose. I’ll blog about it when the process starts in 3 weeks. 3. Every year around Christmas, someone in our family gets the stomach flu. Every year around Christmas, I spend most of the time worrying about who will be next. Who will get sick on Christmas? Who will it be the unlucky one? I have not been spared that stress this year, but I’m trying to think positive and keep the family healthy! 4. I can’t wait for vacation next week! I only have a few days of vacation to use, so I’ll have to work a couple of half days, but hopefully I can do that from home. Just the thought of having almost an entire week out of work is keeping me going during this stressful pre-holiday week. 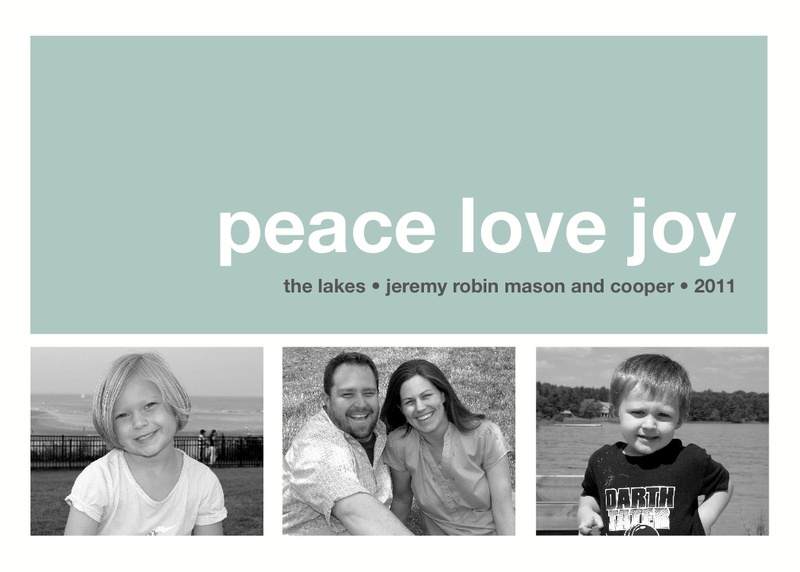 Jeremy is taking two weeks off, and I’m super jealous, but I know he needs the time too. I’m looking forward to some relaxed family time coming up. 5. Less than 3 months until we’re at Disneyworld! Time to get back to wrapping presents for Santa. Gosh, I love Christmas! Every night at dinner, we go around and say what our favorite part of the day was. Mason always asks, “Can I have two?” We urge her to pick just one, but two still come out. Well today can I have two? 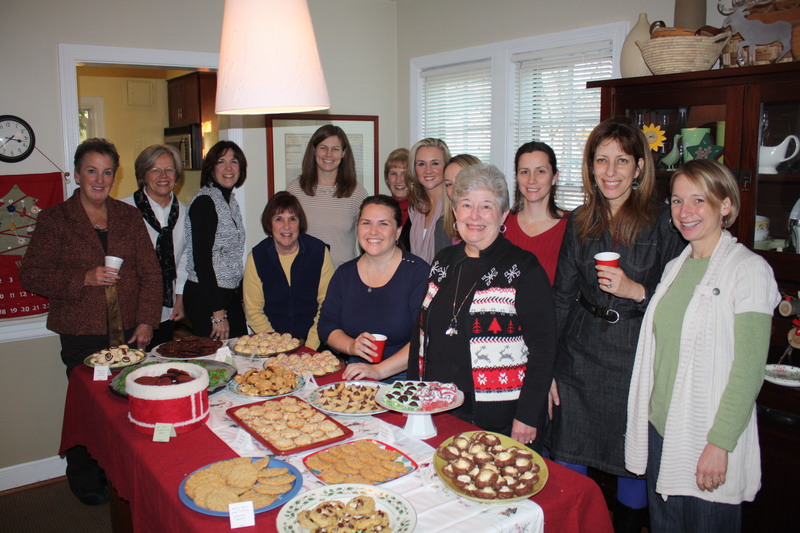 #1 - It was cookie swap day! 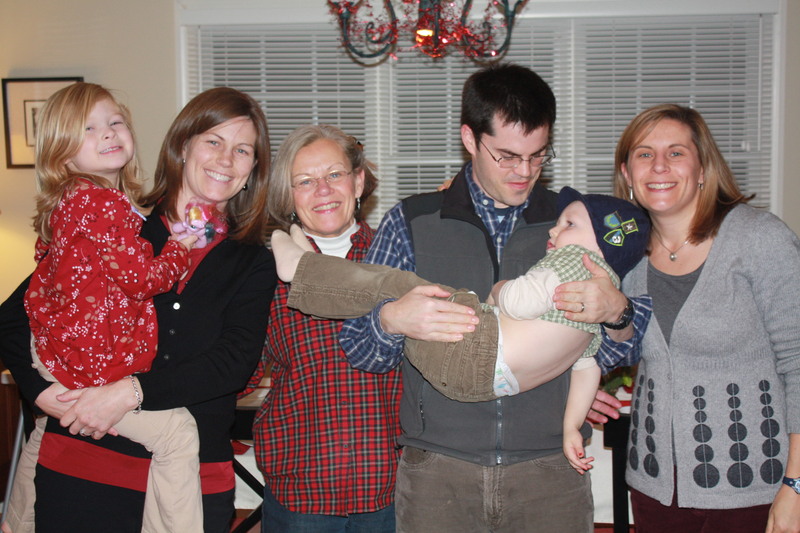 Catching up with friends and family and eating a lot of delicious cookies! Need I say more? #2 - Jeremy. After spending well over an hour modifying Cooper's Star Wars blaster yesterday using cardboard and first aid tape, he spent even more time today making Cooper a cardboard motorcycle. Seriously, it's awesome! I'll have to show the finished product another time. Best Daddy ever! Great weekend! Let’s hope I can keep up the energy during the work week! It was easy to find the good today… Laughter. And lots of it. It was one of those days when the kids are so cute and lovey-dovey for 80% of the day that you forget about the 20% of the time that they are fighting and bickering. I’m glad the laughter won out today. My good for today is the fact that Jeremy came home after a long week of travel and hard work deadlines. We got to make pizza and watch Family Game Night together as a family. It was so great to have the time together, and I’m looking forward to an exciting weekend ahead. My good for today was getting to give both Mason and Cooper warm cuddles this morning right after they woke up. Bed head and fuzzy pajamas and all! p.s. I’m in a funk this week, so my goal is to find something good every single day for a week. My posts may be short, but it’s just what I need right now. And, hey? Isn’t that the whole reason I started this blog?